Stage fright for some public speakers proves totally debilitating. It’s so bad that they simply can not give a speech in public. For these unfortunate would-be speakers there’s a clear need to overcome stage fright when public speaking. Overcoming stage fright takes guts, courage and determination. Of that there’s no doubt. But there’s also stage fright on the speaking podium itself. This is more common than you might imagine. However, you can tackle it more readily. Plan what you are going to speak about. First you want to research your audience and what motivates them. Then, take your time with your speech preparation. Because your aim is for your speech to be both interesting and engaging for your audience. Don’t be rushed. Prepare your materials with detail in mind. Aim to have more speech material at the start of the process than you will have fully edited at the end. I like to write out a speech or a presentation…even when I’m using PowerPoint slides. You will find it easier to practise that way. And you must commit yourself to plenty of practice. Lots of practice. Speak out aloud as you practise your speech. It’s the only way to fully test your voice, its tone and the meaning of your words. There’s nothing to stop you having a small practice audience at this stage. Before you speak remind yourself why it’s you who is speaking. Why it’s you who was invited to give a speech. The answer is obvious. It’s because you have the expertise. The talent and the ability. Does that boost your confidence? It should certainly overcome any stage fright. Stand tall and don’t slouch when you are speaking. Standing tall will assist your breathing which, in turn, helps your speaking. Both inhalation and exhalation are essential for you to speak with clarity and volume. Inhaling gives you breath (!) and exhaling provides clarity and volume. Slowing down the pace of your speech to a comfortable inhalation/ exhalation pattern will do wonders for your fear of public speaking. Breathing. You can’t perform at your best when your breathing is erratic. If you are one of those speakers whose breathing stops when you concentrate, then you need to solve this! Therefore, pause, breathe and speak. A solid approach to breathing creates good pauses and a great public speaking effect. Stage fright is always unnerving, so here are five tips to help you build your confidence before a speech. Plan ahead, so you are fully prepared. Prepare all your materials ahead of the speech. Remind yourself just how good you are with the speech topic You are an expert! Stand tall and boost your confidence. Get your breathing under control. Slow and measured breathing results in a measured speech. 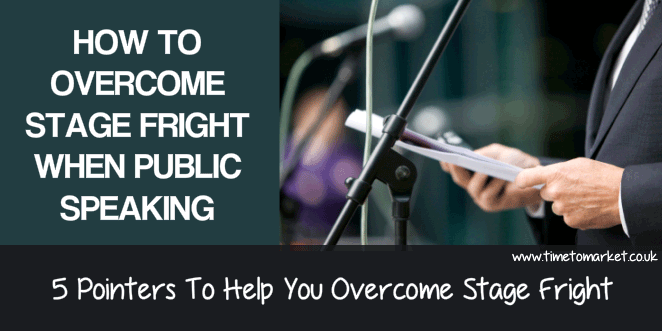 So, is it difficult to overcome your stage fright for public speaking? It can be. But you can work at it. And you can overcome it. You can learn more about how to overcome stage fright when public speaking on a public speaking training course at one of more than 40 UK training venues.